You have to hand it to Nintendo, they sure know how to create a series designed specifically to show off the 3D capabilities of their new hardware platforms. 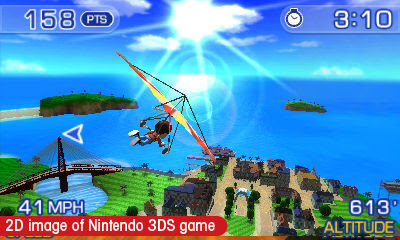 Pilotwings is that flagship series which gave us our first taste of Mode 7 scaling in Pilotwings for SNES, then gave us a taste of polygon processing power in Pilotwings 64, and now the series has been brought to life in full stereoscopic 3D with Pilotwings Resort on the Nintendo 3DS. Over and above being a glorified tech demo, the Pilotwings franchise has been really solid, with great gameplay and visuals to keep gamers coming back for more, and this latest entry is no exception. Aesthetically, the game looks a lot like Wii Fit and Wii Sports Resort, and for good reason -- its setting is the familiar Wuhu Island. While it might seem like Nintendo was just being lazy reusing this island yet again, for Pilotwings Resort it's the perfect island with its scenic landscape filled with mountains, windmills, a giant volcano and the surround archipelago﻿ of mini islands. The interface couldn't be simpler. You begin by selecting one of you Mii characters (you're forced to use a Mii as there is no create-a-character mode) and enroll them the Wuhu Sky Club to earn their pilot license﻿. You have your choice of Mission Mode﻿, which teaches you the basics of flying and gradually advances to more complex challenges. 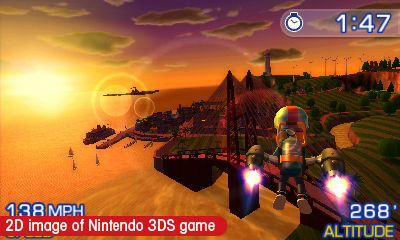 There's also Free Mode where you can pilot an aircraft freely around Wuhu Island to collect landscape icons or special trophies that unlock different times of day, dioramas, new aircrafts, and more. There are three main modes of flight: a plane, a hang glider or a rocket belt. Each mode feels unique in the way they handle, their speed, and method of landing. All three feel realistic which is important in a game like this, and are also brought to life with rich 3D effects such as the plane exhaust and hang glider wind rifts. Mission Mode challenges start off pretty easy and have you perform maneuvers such ascending, diving, barrel rolling and landing. You're graded on a number of variables such as time, number of rings flown through, number of guide dots collected, and the finesse of your landing. Each challenge awards up to three stars based on your performance, and a certain number of stars must be collected before advancing to the next set of challenges. While the entire game can be "completed" in roughly 4-5 hours this isn't a game that is meant to be rushed through. The real fun of Pilotwings Resort is simply enjoying each flight as you steadily improve your skills and fly with more grace. Wuhu Island looks incredible in 3D and you might find yourself occasionally distracted from flying while your eyes peer off into the distance at a scenic landmark. Definitely a mark of great visuals. This game is fun pure and simple. It's a great showcase title for the capabilities of the Nintendo 3DS and is perfect for those downtime moments when you have time to spare. 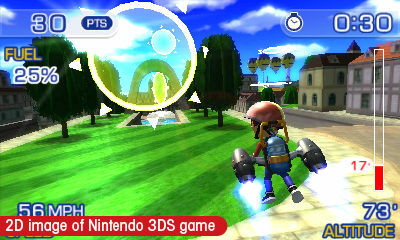 Playing through Pilotwings Resort makes me even more excited to see what's next on the Nintendo 3DS horizon. Very interesting review. If there's something I LOVE doing in videogames is flying, so this would be a perfect title for me... that is, if I did HAVE a Nintendo 3DS... but oh well. Hmm... I wonder if they will ever release a version for the Wii; that would be awesome!